First published five Christmases ago, this story is being republished by popular demand. 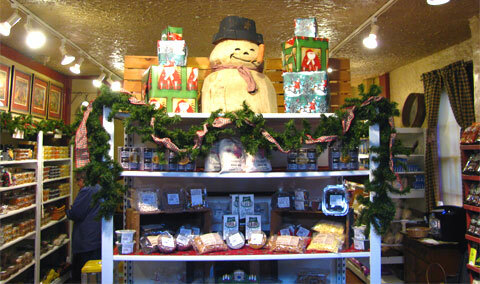 The Village Pantry still holds open house every year, and this year it was again held on December 3. 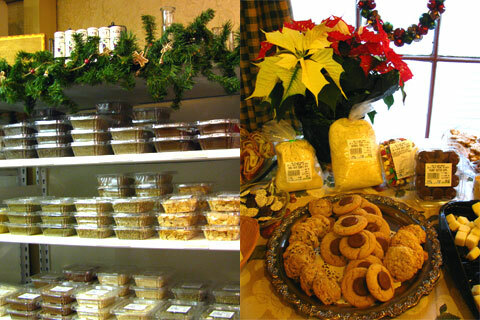 SINCE 2003, in a building built in 1850 and at one time used as the post office (1878–1927), The Village Pantry at 221 South Main Street has been lending its old-world charm to the village atmosphere that permeates Poland, Ohio. Open House is a cozy event held during the holiday season, and this year it coincided with the lighting of Poland Village. Villagers out in the cold to witness the community Christmas tree being lit at 7 p.m. could duck inside for some soup or a cup of hot cider to warm their chilly hands. However, many hours before night fell, there were those of us who showed up and then didn’t want to leave. 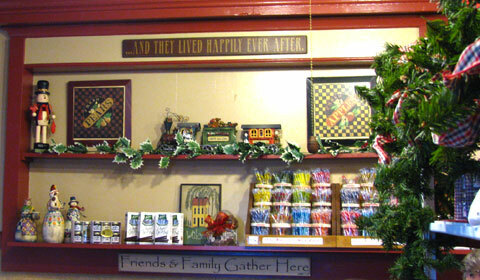 The slogan “Friends & Family Gather Here” posted on one wall is the defining theme for The Village Pantry. Sure, you can buy fresher-than-most-grocery-stores-but-incredibly-cheap bulk herbs and spices, ingredients for a baking marathon, Amish products, nostalgic sweet treats and more—but it wouldn’t be as special without the community feel of this lovingly-preserved place. Owners Joanne and Ron Eiselstein have also been the coordinators for Movies Under the Bridge for ten summers. Their gracious presence and welcoming of family and friends seems filled with pleasure at seeing you enjoy their store and feel at home. 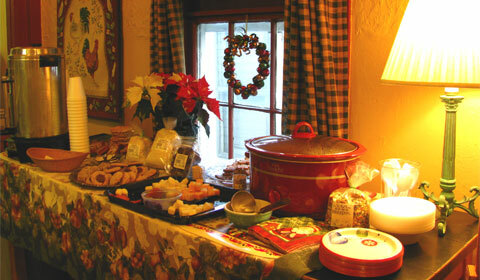 The first order of business after we arrived was to eagerly give in to Joanne’s urgings to have some soup or hot cider. The feast table was laden with cookies and other goodies (nearly all sourced from products sold in the store) but I decided to be sensible and start with the soup. Made with the store’s Holiday Soup Mix of colorful dried beans, the addition of a ham hock made it just the warm and hearty late lunch I needed to sustain the recreational eating that followed. My friend Brian was keen to sample the hot cider, which is so good there are fans who show up every year and make a beeline for the cider urn. Joanne concocts it using cider from White House Fruit Farm, Canfield, Ohio, brown sugar, cloves, whole allspice, a cinnamon stick, and a cut-up orange that sits in the coffee basket of the urn lending extra flavor throughout the day. My favorite was the chocolate chip cookies: there were so many chocolate chips I could hardly believe it was a mix! I promptly bought a bag of mix to bake at home. I also bought granola for weekday breakfasts, blueberry muffin mix for Sunday brunch, craisins for salads, saffron jasmine rice (I love that stuff! ), Bear Crunch Popcorn (watch out, this is addictive), peppercorns and cumin. And I simply HAD TO buy another box of Cocoa-Dusted Almonds (my adoration of these began during the summer at Movies Under the Bridge). After my initial holiday food lust was sated, I started paying more attention to my surroundings. Having become acquainted at Movies Under the Bridge with Joanne’s flair for creating atmosphere, I was not disappointed. In addition to several smaller hand-carved snowmen displayed on a shelf above the cash register, I loved this large solid wood Santa Claus that Joanne found at a craft show. In the corner next to the front door, Ron and Joanne have created a permanent tribute to cooking nostalgia with a Magic Chef stove circa 1930s that Ron found in a rental property he was managing. The stove was so dirty they believe the thick grease may have preserved it! 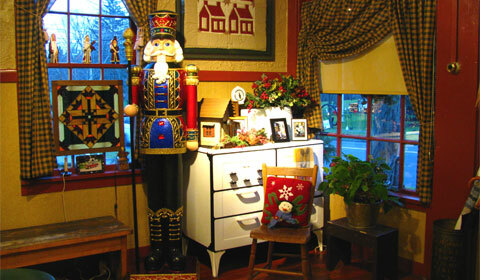 At Christmastime Joanne adds some holiday decor, including the soldier from The Nutcracker ballet seen above. The umbrella stand next to the front door (from an old dairy company, formerly used for holding ice cream) held a toy horse on a stick with a red head and a black mane, calling to mind an old-fashioned Christmas gift. 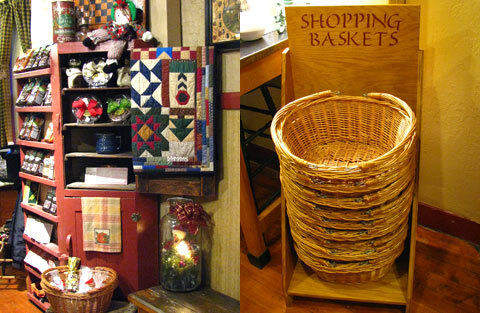 A cabinet made by Joanne’s father displaying coffee beans and holiday gift boxes held more of Joanne’s treasures: a Raggedy Ann doll given to her by her parents (who visit the store regularly and were there for Open House) and a quilt bought in Amish country. Next to the cabinet was a snowman in a Mason jar lit by a candle bulb that Joanne got from the Butler Institute of American Art. 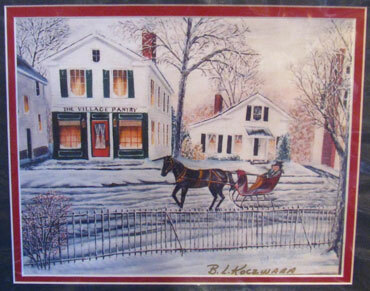 Speaking of the Butler Institute: One year Ron and Joanne went to the Holiday Show at the Butler and were pleasantly shocked to see a large oil painting of The Village Pantry done in Victorian style by local artist B.L. Koczwara. They bought the original for themselves and also have some prints for sale in the shop. Other artists and craftsmen have reproduced The Village Pantry in their own medium, including a woodcut of the building and a black-and-white sketch. One day the former mayor of Poland came over with a black-and-white photo of the building from the late 1800s, when it was used as the post office. In the scene, Main Street was a dirt road and a man sat in a wagon out front with a sack of mail. As dusk approached, I went outside to get a photo of the storefront with the Christmas lights on. I took it from a dozen different angles until I could properly include the mama and baby reindeer in the shot, which were made by Joanne’s father. It was so friendly and cozy in the store I hated to leave. But as we got into our cold vehicle in the parking lot behind the building, I was reminded of Joanne’s attention to detail—and her ability to extend the spirit of hospitality into unexpected corners. The wreaths she placed on the back of the shop gave me a final moment of holiday cheer before heading home to our own suburb. 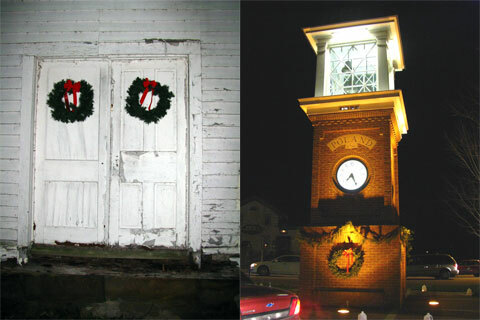 And the clock tower as we were leaving Poland reminded me we were leaving a village that really does look and feel like a village. . . .
Open House at The Village Pantry took place on December 3, but I hoarded this story till New Year’s Eve as the perfect closing for the old year here at Milliver’s Travels. 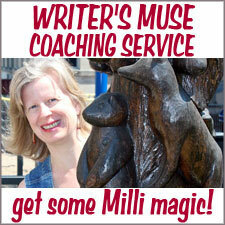 Milli Thornton (aka Milliver) is the author of Fear of Writing: putting the fun back into writing. 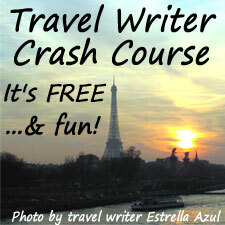 She is owner of the Fear of Writing Online Course and she coaches writers individually at Writer’s Muse Coaching Service. Oh My Gosh, the ambiance of this marvelous treasure warms the heart and grounds the soul in roots and home. It is like a step back in time to something wonderful to read this. What a remarkable place and well illustrated in words and pictures by you Milli! I bet it was hard to leave a place like this. I want to go there! 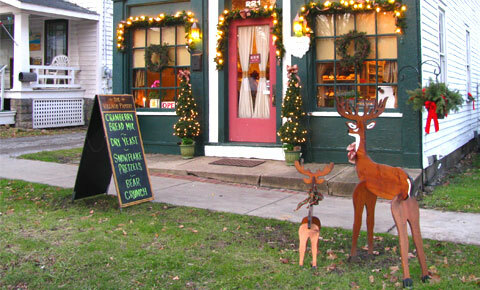 Brilliant idea to have Millivers Travels writers submit stories about Christmas in their hometown. I loved them all! Great job Milli and contributors!! Ambiance. Now that’s the perfect word for it. Yes, the Village Pantry is chock-full of ambiance. So pleased you enjoyed my story and pictures. 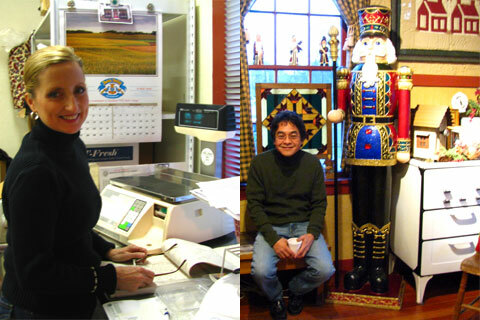 And THANK YOU for being one of the wonderful contributors to the Christmas series at Milliver’s Travels.